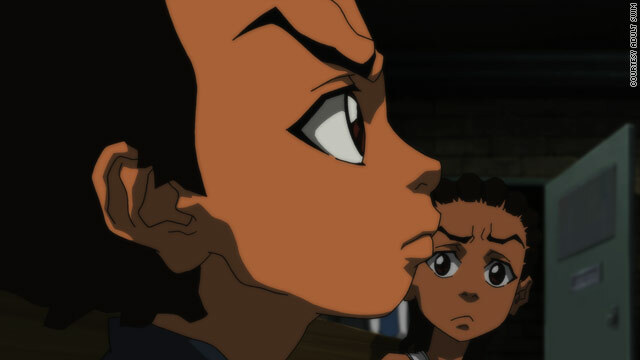 "The Boondocks" centers around the exploits of brothers Huey and Riley Freeman. (CNN) -- At the end of Sunday's third season premiere of the popular animated series "The Boondocks," the main character, Huey Freeman, uttered a phrase that die-hard fans are hoping is just a joke: "I'm retired." The Peabody Award-winning show is rumored to be in its final season, much to the dismay of the many admirers who tune in for its satirical and subversive take on culture, politics and race. More than 2.5 million viewers watched the premiere episode on Adult Swim (which, like CNN, is part of Time Warner) setting records for that network. It's been a long wait to get to season three -- almost three years. Writer RK Byers said fans have waited a long time for Aaron McGruder's blend of Afrocentric, hip-hop sensibility mixed with thoughtful commentary and a rapier wit. "There are a lot of people who share Aaron McGruder's views, but the composite he presents is unique," said Byers. "When 'Boondocks' came out it was literate, funny and geared towards a black intelligentsia that a lot of people couldn't even imagine existed." The series, which grew out of McGruder's now-defunct comic strip of the same name, centers around 10-year-old "domestic terrorist" Huey Freeman, who believes that "Jesus was black, Ronald Reagan was the devil, and the government is lying about 9/11." Huey has a younger brother, Riley, who is enamored with gangsta culture and "keeping it real," and a beleaguered grandfather, who is raising the pair in the suburbs. The "Boondocks" strip attracted plenty of controversy -- some newspapers pulled it after McGruder poked fun at then Secretary of State Condoleezza Rice and her love life -- and the series has been no different. The TV "Boondocks" has made liberal use of the "N-word," which brought with it high-profile complaints from the Rev. Al Sharpton and others. Almost five years after the show premiered, there are still some who are rubbed raw by the language and characters like Uncle Ruckus, a black handyman who hates other blacks so much that he calls them "monkeys" and weeps at the possibility of a black president. "People keep saying that it's political satire, but to me the language and the characters are derogatory," said Carl Cunningham Jr., the director of multicultural affairs at the University of South Alabama. "We have enough negative images [of black people] out there and this just adds to it in my opinion." Indeed, in an era where the animated show "South Park" is sparking the ire of some for its portrayal of the Prophet Mohammed, "The Boondocks" hasn't shied away from skewering hallowed figures. In one episode, season one's "Return of the King," the Rev. Martin Luther King Jr. emerged from a coma, with edgy results. "Aaron McGruder's brilliance is special and it's rare to find people who can present real issues with substance in a 'fight the power way' without pointing fingers per se," said Toni Blackman, an artist and educator who's a fan of the show. "[His use of the N-word] has added to the street debates in the cafes and the barbershops. It's re-energized that conversation and moved it beyond academia." There has been no official word that season three will be the last, but McGruder has hinted at such. Prior to the season debut, he tweeted on his Twitter account: "BTW, Sony has officially asked me to STOP referring to it as the last season. Hilarious... I think it's kinda too late, now..."
That disheartens fans like Leslee Clerkley, who works for local government in southeastern Michigan, who said the series sometimes makes her uncomfortable even while it entertains her. "The show is different than anything else on TV," she said. "I'll miss it, but I think that also depends on how this last season goes, because some shows stay on well past their time." Web designer Mark Ricks has been a fan since the advent of the comic strip and said he owns all the books and DVDs of the past seasons. In McGruder, Ricks sees shades of a comedic legend who was also controversial in his time. "Richard Pryor was able to take race and make it funny, but also make you think," Ricks said. "That's also what Aaron does. He's a resource that we need because we need to laugh at ourselves."